So, in the past few years that I've been thinking about starting this blog, I had thought about the various platforms (WP.org, WP.com, Blogger) and some that I have found since I've researched platforms at my current job (Zoho, Bitrix24, Google Sites). I was most familiar with Blogger as that is how I hosted a blog when I lived in China, but that was also 10 years ago. I have been thinking about starting this blog for over 2 years. I have gone through I can't tell you how many fonts, designs, palettes, journals, notebooks, pens. You name it. Then, I actually started to create different websites. I think I've created the same website at least 5 times now on different platforms. Finally, I decided I just have to begin because well, why not? I love journaling, I've blogged in the past about a totally different topic, China, which is still my passion, but it seems like the right time to begin something fresh and new. So here I am...trying to find my WHY. I have found a lot of it over the years through self-reflection, writing, being introspective, reading, and most recently through my husband and little Bella Boo. Ultimately, I want to work for myself so I have the freedom to raise my little girl, have financial freedom, am not constrained by debt, and to express myself publicly through the written word. I look forward to the adventure. 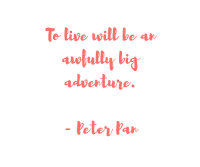 For life truly is always a magical adventure.